In 1837 Representative Joseph J. Anthony stabs the speaker of the house to death during a debate about wolf pelts. In 1899 Hot Springs police shoot it out with the county sheriffs over control of illegal gambling. In 1974 President Richard Nixon resigns in part due to the outspokenness of Pine Bluff native Martha Mitchell. 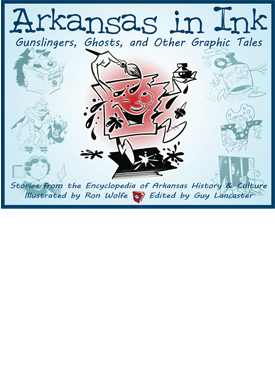 In this special print project of the online Encyclopedia of Arkansas History & Culture, legendary cartoonist Ron Wolfe brings these and many other stories to life. Accompanied by selected entries from the encyclopedia, Wolfe’s cartoons highlight the oddities and absurdities of our state’s history. Seriously, you couldn’t make up this stuff. Guy Lancaster is the editor of the online Encyclopedia of Arkansas History & Culture, a project of the Butler Center for Arkansas Studies at the Central Arkansas Library System. He lives in Little Rock with his wife, Anna. Ron Wolfe is a cartoonist and features writer for the Arkansas Democrat-Gazette as well as author of the graphic novel Knights of the Living Dead. He and his puppeteer wife, Jan Wolfe, live in Little Rock. Distributed for the Butler Center for Arkansas Studies.